The Diploma in Business Administration (DBA) programme at Sunway College provides students with a broad understanding of general business principles and practices. The programme equips students with administrative and organisational skills in order to become efficient and effective administrators. The programme also aims to equip students with relevant knowledge and key business skills to deal effectively in a rapidly changing business environment. Generally, the programme covers both the breadth and the inter-disciplinary aspect of business. It balances conceptual knowledge with an applied curriculum that is also suitable for various positions in various industries. It also offers a unique opportunity to enhance student understanding of the enterprise in a competitive situation. Upon completion of this programme, students will be more confident and get a competitive edge which leads to enhanced employment opportunities. The DBA programme provides a solid foundation in general business for undergraduate degree in Business Administration or related areas. 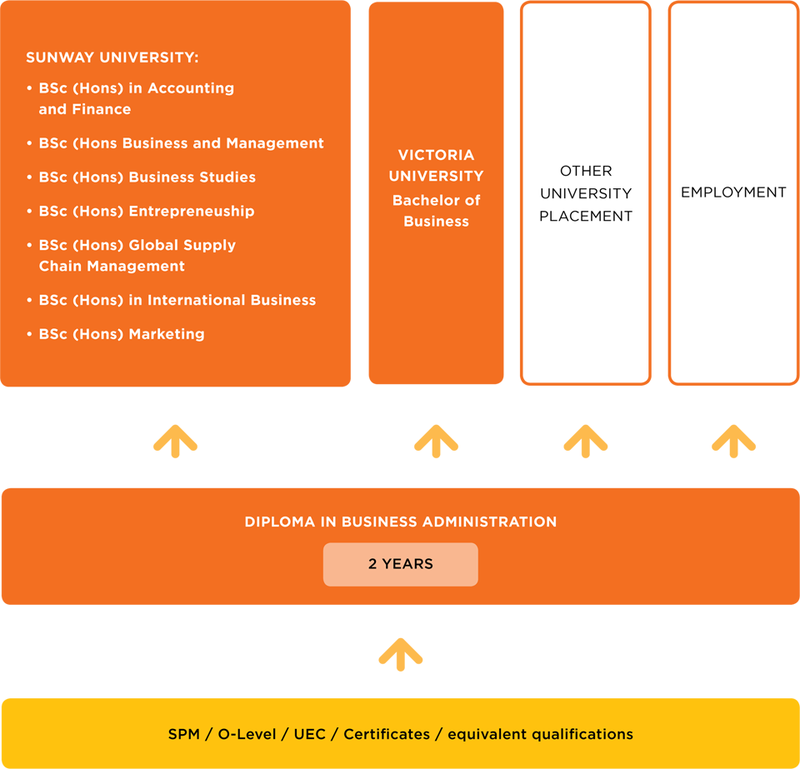 DBA provides an entry into the BA (Hons) Entrepreneurship, BSc (Hons) in Accounting and Finance, BSc (Hons) Business Management, BSc (Hons) Business Studies, BSc (Hons) Global Supply Chain Management, BSc (Hons) in International Business and BSc (Hons) Marketing at Sunway University. The DBA programme provides the knowledge and the contemporary skills for a global career in business. The Interdisciplinary modules in this programme includes entrepreneurial and community service literacy, providing students of the programme with social and entrepreneurial development. Learning and innovation skills are attained via instruction methods, assessment strategies and the learning environment. While exposure to the various information, media and technology modules, students will develop collaborative and communicative skills. Students practical experience and networking opportunities will be gained through internships and professional placement. Opportunities of employment are presented through the modules focusing on employability, agency engagement and professional placement. The programme is taught by qualified and experienced lecturers with a combination of practical and academic experience. Business administration is a wide field that incorporates many types of management positions. From major corporations to small and medium businesses, every operation needs skilled administrators in order to succeed. A diverse range of career prospects in a number of industry including banking and finance, manufacturing, product development, human resources, IT management and business analysis presents itself to graduates of the programme.